Growing a business is more productive when you focus on social media strategies. At least, that’s how successful brands do it. Yes, the work never stops. So how do you, an entrepreneur who does business in the morning and rests at night, manage a to-do list 24 hours a day? Don’t fret. Thanks to innovation, there is an answer in the form of social media automation. Some digital marketers forget that Social Media Marketing (SMM) is more than just posting content and waiting for immediate results. Businesses, especially startups, have to continuously work on implementing this strategy, investing a tremendous amount of time to produce satisfying output. Doing this means maximizing your office hours. Most of the time, even outside your work clock. Automating your online marketing content helps your entrepreneurial efforts become less stressful. Be it a growing presentation firm or an established online clothing shop, every business sees social media as an essential tool for executing marketing campaigns and increasing brand awareness. It saves you time and keeps you organized through the aid of tools that let you plot your marketing calendar in advance. Allowing you to manage your accounts conveniently while receiving and sending feedback to old and new customers. As various social media platforms trend rapidly, the adaptability of businesses towards change are put to the test. Asking the questions: Will they be noticed? Can they remain relevant in the industry? Failing to be in tune with the latest online trends can hurt your business big time. 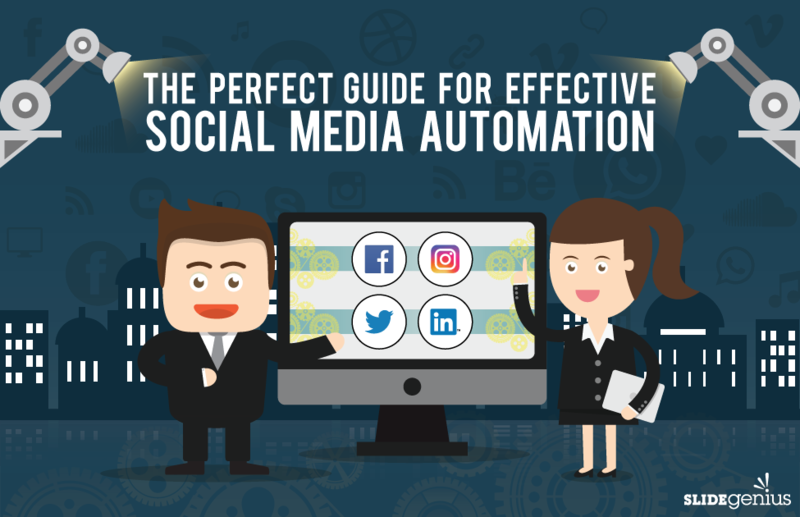 If you want to survive this fast-changing world, here’s a cheat sheet on the basics of social media automation from SlideGenius. Check it out below. Let social media boost your brand by using the right online platforms and marketing strategies. Take note of the latest online trends and allow your business to pick-up the change. Social media automation can help you accomplish this, successfully and hassle-free.